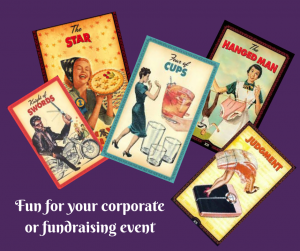 Planning a corporate or fundraising event? How about a popular, fun, low maintenance – high impact entertainment option?! Having a Tarot reader on-site adds an exciting, mysterious and interactive form of entertainment that your guests will love! It’s also great for parties, hen nights, baby showers and girlie nights in! All I need to add a touch of mystique to the evening is a table, a couple of chairs and a jug of water! I don’t need to be snuggled away in a private room – but it’s best to be slightly away from loud music and frantic activity so that your guests can enjoy their reading without any distractions. As a business and marketing consultant with a life coaching qualification, a masters degree in Applied Linguistics, an honours degree in English and Psychology and a neuro-linguistic programming certificate, much of my time is spent advising business owners on how to unblock their potential and move forward strategically. This makes it a perfect fit for a business or corporate event! So whether you’re organising an intimate get together or a large scale corporate event, I’d love to chat with you! To find out more, please email info@tarotbyemail.com.